Pretty much every photo you see on the internet, social media or on advertising campaigns has been subjected to at least a little tweaking. These next images though, as extraordinary as they are haven’t been altered one bit. From surfing motorbikes to levitating weightlifters, they’ll leave you speechless and a little dumbfounded. 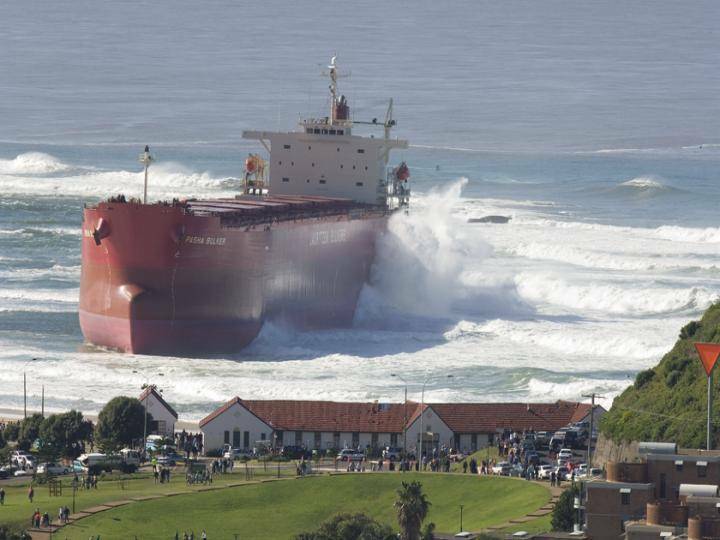 The Pasha Bulker was a Japanese owned bulk carrier tanker that ran aground in Newcastle, Australia in 2007. While the photo itself looks daunting, a massive ship ominously making its way to a town, it definitely hasn’t been touched up to appear that way. The massive tank struck disaster when a storm hit Nobby’s beach (yes its real name) and spent the next month sitting on the sand. Mile High…Tennis Match! Now this one will have you thinking WTF? Although it looks like a nerdy teenager’s attempt at photoshopping, this crazy looking image is as real as it gets. Those two tennis players are none other than Andre Agassi and Roger Federer atop the Burj al Arab. Not only is this converted helipad dizzyingly high, the hotel it sits on is the fourth tallest in the world! Lesman Parades is probably more well known for this eerie looking image than his actual career as a weightlifter. While it might look like some image enhancing trickery it’s actually just down to good photography and timing. At the Junior World Weightlifting Championships in 2015 a quick thinking photographer snapped this image that has been turned into countless memes and gifs. Lucky Lesman. Adou Ouattara soared to internet fame when a photo of him that everyone in their right mind believed must have been photoshopped, turned out to be horrifyingly true. As an eight-year-old he was smuggled from the Ivory Coast in West Africa in a suitcase to Spain, hoping for a better life. Don’t worry though, this story has a happy ending. 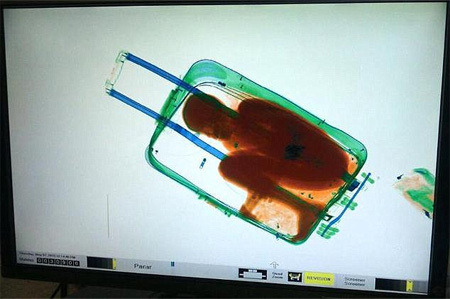 The young boy was quickly reunited with his mother and granted temporary residency. Now, when you’re first learning photoshop one of the most fun and easiest things to play around with is photos of sharks lurking in the water. Beachwear brand Insight’s campaign doesn’t just look photshopped, it looks like it was a done by a teenager. Don’t be fooled those, these images are as real as it gets. The photographer put it down to good timing, patience and carefully, to be fair photoshop would have been easier. This one has got to be fake, right? Or maybe just a great illusion concocted by a skilled image editor? Nope, it was all down to perfect timing and hockey players doing what they do best – punching each other in the face. Norway’s Ole Kristian Tellefsen and Petteri Nokelainen from the Finnish team’s photo has circulated on the internet since 2010 and has left most people stumped. Stephen Colbert in a bikini, yes you heard that right. A genius cosplay enthusiast managed to outdo everyone at the Monsterpalooza convention when she showed up with an impressive rubber mask and a bikini. Now it is certainly creepy and definitely unique but also 100% real. This one looks too strange to be real but it totally is. A boy was born in Huan, China with a total of 31 fingers and toes. Hong Hong as he was nicknamed broke a world record when he was born with 15 fingers, 16 toes and no thumbs. Although the world believed it to be photoshopped at first, he has since undergone surgery to correct the unique deformity. While this next image wasn’t pointed out for looking photoshopped it caused a stir because what National Geographic claimed to be a photograph looked more like an expensive painting! However it truly is real, the image is of the Namibian desert at twilight where the sun hits the sun dunes between the trees. Don’t believe us? Look it up for yourself. We wish this photo was edited but unfortunately that isn’t some filter or lighting technique used to make the Kazakhstan’s capital Almaty appeared to be drowning in smog, it’s the real deal. It’s not hard to understand why Eurasian country lost its bid for the Olympics, there’s more pollution than fresh air! So, while this image is shocking just keep it in mind next time you find yourself complaining about a little pollution! Aliens do exist and they are stealing our ships! This vessel has clearly been called back the mothership, there is no other way to explain this photo. Or is there? This clever picture was snapped at a Scottish Gold Tournament and quickly had the internet shouting Photoshop! Alas, it’s merely just a normal boat floating in the distance. Why did we put in a drawing of the silver surfer you ask? This is meant to be an article about crazy non photoshopped images? Yes, that is exactly what this is. That is a human, painted and posed to look identical to the real thing. If you squint your eyes, tilt your head and look really close that surfer has real fingers and wrinkles. Yes, really. “Hey man do you think you could photoshop me riding an Ostrich?” “Yeah, of course bro!” That’s exactly what you thought happened when you first saw this photo but believe it or not there are places in the world where people do ride and race on Ostriches. Before you start thinking it’s only in places where they don’t have access to you know, horses or camels one of the biggest Ostrich races in the world is in Arizona. You don’t usually think that goats and trees would go together do you? However in Morocco goats living in trees is normal not a photoshop trick. The now famous goats have been living this way for years (yes before photoshop existed) to try and forage for nuts and seeds that are used to create the world famous Argan oil hair treatments. What we want to know though is how do they get back down? What’s out of place in this photo? Is it the bridge in the background or perhaps the two sailor staring off into the distance? Oh wait, it’s the massive rubber duck! This yellow monster isn’t the result of someone having a tone of fun on photoshop but actually a very successful advertising campaign. Share this with your friends and family to see if they believe these aren’t photoshopped!